Ever since I finished reading Ready Player One followed by some furious spamming, recommending the book every Goodreader I know, I've been lying in wait for a similar book based on virtual worlds and video games that'll blow my mind. Yesterday afternoon, I came across Erebos. By evening, I had obtained an e-copy. Come midnight, I was fighting sleep trying to finish it in one go. Does that mean it was as good as RPO? No, not by a long shot. 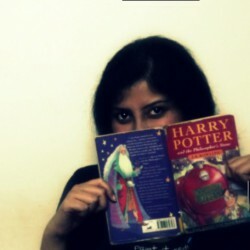 BUT STILL, the first three-quarters of the book was fast and furious enough to keep me glued to the edge of my bed. So, we have mysterious DVDs being distributed throughout Nick's, our MC, school, fellow students are mysteriously failing to turn up to classes and when they do, they seem beyond exhausted but nobody is willing to talk about it, not even his best friend. Nick is desperate to know what's going on and to get his hands on one of the DVDs, but it seems to be an invite-only thing. Finally, finally, he manages to get the DVD from someone who makes him swear to certain rules of secrecy. 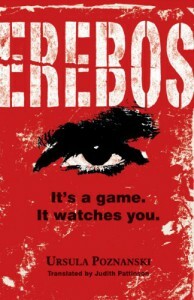 Turns out, the DVDs contain a game called Erebos. It is an MMORPG which happens to be insanely addictive, and also...very much alive? Nick finds out that all of the characters (apart from the players) in the game hardly behave like your regular video-game characters with a limited number of replies and reactions. Instead, they are acutely aware of what's going on around them and can have conversations with the players much like a normal person would. Intrigued, Nick begins to play, slowly rising in levels, thanks to the mysterious Messenger who seems to be in-charge of the game. The Messenger helps the players increase their abilities and strength, in return for carrying out his orders that get stranger by the minute, for, these orders seem to take place in the real world, and the players are addicted and desperate enough to follow those orders without question. Nick is initially asked to carry out mundane tasks, like, moving a package from point A to point B, or going out on a date with someone, but then things progress quickly to him stalking a strange man and taking his pictures, until finally, Nick is asked to poison, and possibly kill, his English teacher! Will he do it? It was immensely fun reading about how the players get to pick their avatars, go on quests, collect "wish crystals" and fight in the arenas, always, with the Messenger lurking menacingly in the shadows. But, the last quarter where we figure what's going on, who created Erebos and what the point of it all was, is a big dampner. The twist is such a cliche that I was quite disappointed; I was hoping for something bigger and fantastic. Apart from the slightly-lame ending, this is well worth a read, especially if you happen to be an avid gamer!